Get ready for a squeeze. The chart seems to end in Dec 2013. Per the chart, it looks like the short positions were largely taken in late 2013, when the markets were still rising sharply / the expectation was that stocks would rally into the end of the year, and also into 2014. Anyway, back then the markets were considerably less nervous than today. The chart seems to end in Dec 2013. I'm not seeing what you are seeing. In the upper left hand corner, the chart says, "As of 1/28/14." The last data point is labeled as "1/28/14." On 1/28/14, the 10-year yielded 2.77%. I would argue that there is plenty of squeezing potential left. Not saying it wll be squeezed. Not saying it won't. I would point out that the rate has fallen a bit since then though. Beware the iron grip. As a side note, could they have chosen a worse x-axis time scale for the chart? 15 month increments? Seriously? Who does that? Wouldn't years have made things a bit easier to read? In honor of this chart, the next time someone asks me how tall I am I am going to tell them 15" x 5 and let them work through the math. Feet are overrated, lol. Sigh. Ha! That's what happens with basic xls skills. Anyway, this chart is the best presentation ever of speculative fixed income shorts. 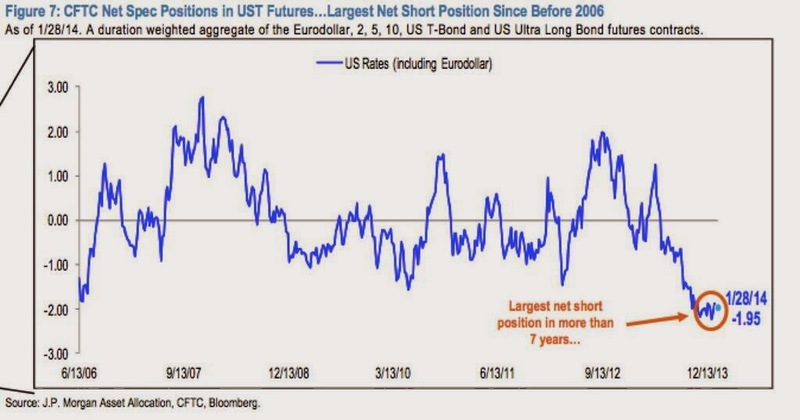 The short position in 2011 led to a big rally in bonds - and this is a much bigger short than that! As a long-term holder of long-term treasuries (mostly TIPS and I-Bonds), your theory here seems sound to me. I have been and continue to be comfortable holding treasuries to maturity, contrary to the popular opinions repeatedly expressed ad naseum on CNBC. In fact, they can pry the 3.4% real yield I-Bonds I bought in 2000 from my cold dead fingers. No greater fool required nor desired. Still have 16 years left to maturity. As for the 0.0% real yield I-Bonds purchased more recently, they are still vastly outperforming the more popular treasury bills. It's almost like 5 years of ZIRP might have something to do with that. As you have pointed out, few seem to factor in the risk rates won't rise though. ZIRP could easily destroy savings one year at a time, just like it has been doing. Rising interest rates are a risk. But a continued fall in yields is ALSO a risk, for those who don't own any/enough bonds. 1. For those holding to maturity, rising interest rates aren't much of a risk. All you lose is the ability to have done better. It's just opportunity risk. Once you buy, you pretty much know what you are getting. Further, as a holder, I still root for higher interest rates so I can reinvest at higher interest rates when my bonds mature. 2. For those waiting for higher interest rates as they sit in treasury bills, the risk is significant. They lose each day they wait, and it's more than just opportunity risk. The losses are real and can compound over time. These losses can only be undone if rates really do rise (which they may or may not). So which is the really bigger risk for those who are absolutely risk averse? The risk of not doing better or the risk of losing each and every day? I say the latter. Of course, that's not what people are told of course. Time after time I hear the experts telling people to sit on the short end of the curve and wait (even with the yield curve so steep). And when I say the losses are real when sitting in treasury bills, I'm talking about the real loss of purchasing power. I think your point number one is very good. And we certainly do "hear the experts telling people to sit on the short end of the curve and wait (even with the yield curve so steep)". I'm personally not that worried about purchasing power losses. Look at Japan CPI, flat for 20 years. But of course I also know that better distressed debt and value investing opportunities will come along eventually. I'm not all that worried either, but I sleep better with the insurance. If real yields do continue to fall (big if), there would add some inflation pressure someday. That said, my inflation protected treasuries and I-Bonds preserve more purchasing power at lower inflation rates than at higher inflation rates (due to the taxation of inflationary gains), so I would hardly complain about a flat CPI. I-Bonds are especially interesting because they can never deflate. They are always worth at least as much in a given month as they were the previous month. I believe it is therefore theoretically possible for a 0.0% I-Bond to pay more than 0.0%, should we toggle between positive and negative inflation rates. Put another way, I-Bonds can inflate during periods of inflation but cannot deflate during periods of deflation. That's pretty much a win-win for me. The composite rate (the fixed rate at time of purchase plus the current inflation rate) is reset every 6 months but can never go negative. Yeah, I'm only speaking for retired people like me. I've already swung for the fences and it paid off. Now that I don't have a job to fall back on if I swing poorly, I'd rather just lock in something acceptable and call it good. That's especially true since I'm a risk averse permabear, lol. Sigh. And as we both know, we could easily look back a decade from now and realize that today's interest rates were not all that low. Real yields were not just negative in the 1970s, but also in WW2. Thanks for the clarification. TBH I did not pay attention to the notation on the chart about how current the data is - just the (admittedly odd) x-axis, which, on rough viewing, does not seem to extend into 2014. Anyway, the point about most of the shorts being apparently put on in late 2013, I guess in anticipation of the year end rally, which did materialize, also maybe a continuation into 2014, which did not, still stands. I guess if markets continue to struggle then treasuries will catch a bid - that is what usually happens. How hard that will come and how far it will go remains to be seen. I for one had terrible luck trying to make money on the short side the last few years. So terrible I gave up. Practically perfect market timing was necessary. Whenever I thought 'The market cannot possible recover significantly from here', it did. Just brutal. Not only did chart have odd scaling on the x-axis, but it also doesn't have tick marks on the x-axis. The data is great, but the chart is awful. I had to stare at it for more than a few minutes just to make sense of when things were really happening, and even then it is beyond difficult. I guess if markets continue to struggle then treasuries will catch a bid - that is what usually happens. How hard that will come and how far it will go remains to be seen. For what it is worth, I made a prediction in May of 2012 that the next recession will hit by October of 2014. It's a fool's game to predict such things that far in advance, but I'm sticking with it. Other than continuing to be in long-term treasuries long-term, I have no monetary "bet" on that outcome though. Here is today's supporting evidence. The economy is like a game of musical chairs. If the music's been on a while and there are high inventories, get ready for the music to stop. Mark, you believe in maxing out I-bond purchases? It ticket back up to 20 bps after being at 0 for 4 years?! If the music's been on a while and there are high inventories, get ready for the music to stop. Oh, man. I just did a post with inventories in it. Seriously. I've been doing it for 14 straight years, so yeah. To me, it's like buried cash with inflation protection. There are so many advantages. If interest rates were to spike higher, you can simply cash them out (must hold one year, 3 months interest penalty if cashed out before 5 years). No greater fool needed. No damage taken to sell. In the first years, I didn't realize I could double my purchases by buying both paper bonds and electronic bonds though. Still kicking myself over that. Fortunately, I made many purchases before they started to close the barn door in 2007. The reduction from the $30,000 annual limit in effect for both series since 2003 was made to refocus the savings bond program on its original purpose of making these non-marketable Treasury securities available to individuals with relatively small sums to invest. I find it interesting that the government announced this the very month that the Great Recession began (not that many were claiming there was a recession at the time). I generally make predicting the rate a bit of a game (one I take very seriously). I haven't been doing it lately though, due to it feeling a bit like shooting fish in a barrel. I'm basing my prediction on two assumptions. 1. Contrary to popular opinion, we're still in crisis mode. 2. The I-Bond fixed rate cannot fall below zero. There's a chart to go with the prediction. Check it out. It's not as simple as you might think. I've got two versions. One path assumes we're not in crisis mode. One does. So far, the crisis mode version rules the day. Actually, the 0.2% recent rate probably implies that we're trying not to be in crisis mode as much. I believe I would have predicted 0.0%, so it was a bit of a surprise. That said, I strongly believe we'll be seeing more 0.0% rates at some point. Time will tell. Mark, do you hoard liquor or just garbage bags and paper towels? That's hilarious about the ibonds. I like your theories. Odd that you NEVER hear personal financial advice to buy them. I'm not much of a drinker, although this economy may eventually drive me to it over the long run, lol. Sigh. Odd that you NEVER hear personal financial advice to buy them. Had to teach myself how to buy them and how to buy treasuries directly from the government. I'm a big believer in cutting out the financial middleman whenever possible. Hey, maybe that's why financial middlemen never tell us how to buy I-Bonds and treasuries directly from the government. That's a good point. The fixed rate is so low that nobody could make any money selling them to you. The fixed rate is so low that nobody could make any money selling them to you. I think they'd sell them anyway if they could do it with a straight face. When I was turning bearish in 2004, my bank asked if I would like to meet with an adviser. I actually sat down with him to hear his thoughts. It didn't cost me anything so I figured, why not. He presented me with a very shiny binder filled with safe investments. Each sheet was protected by its own plastic sheet. Very impressive. What wasn't so impressive was the massive expenses for their version of an inflation protected bond fund (Hartford). It made the trip worth it. That's 1.6% missing each and every year (for something that can mostly be purchased for free directly from the government). That's just asking for a trip to the poor house. The Barclays US Long Treasury Index has returned around 5% to ~6% the last 5 & 10 years annualized. The Russell 2000 (small cap index) has return 20% annualized the last 5 years, and over 8% the last 10 years. Don't you think it's a little silly to say that you will never own a stock again? I guess if you think we will play out exactly like Japan, then yeah, MAYBE. History may repeat, but the future sometimes likes to do things we mere mortals cannot predict. So it seems a bit risky to go 100% into government bonds. And it seems a bit weird bragging that you are earning 0.20%. But, as you wish. I still enjoy the blog and comments. No. I don't think it is even remotely silly. You have cherry picked the starting point. Let's go back to 2000 (the year I first started buying I-Bonds). Would you have me cash out the I-Bonds that I purchased in April of 2000 to buy stocks? I paid $30,000. As of today, they have generated $38,088 in tax deferred interest. They continue to yield 3.4% over inflation (on both the principal and the interest accumulated so far) and will continue to do so for 16 more years. So yeah, I think I'm pretty much done with stocks. No way I'm cashing those out any time soon. I am extremely bearish on the stock market at these price levels. Let's talk again once the full business cycle has been completed. I don't know if it will play out exactly like Japan, but I will say this. I think stock market investors truly believe that the worst is behind us. 1. 2009 was the worst year for disposable personal income growth per capita. It was also the record low year for consumer price inflation. 2. 2013 was the second worst year for disposable personal income growth per capita. Once again, inflation came in below expectations. As I have said before, if I am financially ruined in I-Bonds, then I'll be taking the stock market investors with me. I have no doubts about that. The same is not necessarily true in reverse though. Sigh. I am much more concerned about the return of my capital (inflation adjusted) than a return on capital. Better hope I'm wrong to think this way. It is not possible for me to have bragged about earning 0.20%. I don't own any I-Bonds that pay 0.20%. Seriously. I bought at the wrong time and only got 0.0% last year, lol. Those 0.0% I-Bonds are "safe" investments and should be compared against similarly safe things in my opinion. Let's compare them to 0.48% 5-year CDs or 0.04% treasury bills, neither of which offer inflation protection. I have no intentions of swinging for the fences again in my lifetime. This may sound like bragging too, but I retired at 35 off of investments. I grew up in a small farming community in a middle class family. I moved to Seattle with less than $1000 in my pocket when I was 24. I had just one financial goal: retire early. I took plenty of risks to get where I am. Fortunately, they paid off. I'm done. I just want to be clear here. A 0.0% I-Bond does not yield 0.0%. It yields 0.0% plus the inflation rate. If deflation strikes again, it will not deflate though. It behaves like cash in deflation and an inflation protected bond during inflation. Will it make anyone rich? Hardly. Can it protect better than cash, treasury bills, or perhaps even TIPS? Yes, I think it can and will. I have one more thought about cherry picked 5-year and 10-year stock market returns. I know it doesn't sound like it is cherry picked, but it truly is. 5 years ago it was February of 2009. In hindsight, that was a fantastic time to buy stocks. The S&P 500 was very near the ultimate bottom in the Great Recession and nearly 50% off its peak in 2000. 10 years ago it was February of 2004. In hindsight, that was also a pretty good time to buy stocks. The S&P 500 was about 25% below its peak in 2000. It is very hard to make a case that similar bargains abound at present levels. This may be our all time longest thread. Goes to show that there is nothing more contentious than buying fixed income right now. The only thing that would come close would be the debate in the threads in April 2011 when I was calling the silver bubble. You are kind of like Dennis Hopper in Speed! "My current take on inflation is that basket of goods the Fed considers for inflation calculations simply can't inflate due to demographics, credit saturation (all credible future promises have been extracted from the willing) and wealth inequalities." "What's interesting about the current dynamic is that wealthy people can (as a group) create inflation in specific areas on a whim. Since 2008 we've had massive runups in oil, gold, farmland, agricultural products, prime real estate (e.g. Hamptons or London), famous artwork, digital currencies, etc. Inflation in many of these asset classes is completely benign, but when speculative interest centers on something used in the real economy (e.g. oil) the effects are catastrophic." wealthy people can (as a group) create inflation in specific areas on a whim. It clearly explains things since '09. The whole world has been taken over by the hot money mentality. The game seems to be rotate into the next hot asset class first, and get out once the rubes show up. I'm not cool enough or connected enough to venture a guess as to what's going to be the next hot thing. I am certain, however, if rich people get spooked and decide to rotate out of equities it's not going to be pretty. The game seems to be rotate into the next hot asset class first, and get out once the rubes show up. I think that's exactly the game. The wealthy can move into an asset class instantly. Others can only generally move in slowly (the "dollar cost averaging" is good mentality). The buy button is constrained by how much money is available to make a purchase. The wealthy are not constrained, the rest are. The wealthy have no inherent advantage when it comes to exiting though. Everyone has equal access to the sell button. The sell button is not constrained in the slightest. No amount of wealth affects it. The wealthy realize this. Best to take profits before a panic than join the crowd. And then patiently wait to play the game again in the aftermath. I mean i can be a weather man and say "it is going to rain" therefore i won't go outside today. Eventually it will rain and my prediction will be correct. I have never read online readers post so much about how a strategy of 0.3-4% real return instruments is so important. You can buy businesses that will earn real returns in excess of what you are making, if you complete a fundamental review of the business. My prediction of falling real yields has been correct since I became a permabear in 2004. You can buy businesses that will earn real returns in excess of what you are making, if you complete a fundamental review of the business. You cannot know that in advance. It requires you to be able to predict the future. You might want to check out what Warren Buffet had to say about businesses the last time real yields were so low and falling. At present inflation rates, we believe individual owners in medium or high tax brackets (as distinguished from tax-free entities such as pension funds, eleemosynary institutions, etc.) should expect no real long-term return from the average American corporation, even though these individuals reinvest the entire after-tax proceeds from all dividends they receive. I'm not predicting high inflation but I can say this. Low real yields are not a sign of a healthy economy (especially when they go below zero). Ignore them at your own peril. Better hope the following long-term trend has no merit or treasuries could look pretty darned good in comparison to most asset classes. It's not a prediction. I'm just pointing out yet another risk that few optimists want to acknowledge. i think your point of a low interest rate is not a healthy sign is very correct. the counterpoint is it is low to stimulate growth, but i agree the instantaneous data point means it is a weak economy. AS for companies that will outperform the general economy, it does not require a rocket scientist or the ability to predict the future to find those companies. Think micro not macro. You and Buffett have lots of valid points on how macro is/can/will be weak and maybe on an etf/index basis you will not generate a lot of wealth in real returns. Totally agree. But there will be companies that because of their competitive advantages have the ability to earn outsized returns. Asset light business models that are able to add value to customers and have pricing power will far outperform your real return bonds. Does that mean every company in every industry will outperform, definitely not. As for a word of warning/caution that the average investor does not realize or consider a lot of what you have mentioned, and continue to buy overpriced etfs/funds etc. i think you have a really valid point. If you are incorrect you are stuck with a 0-3 maybe 4% real return portfolio which after tax is say 2-3% and equities may deliver 5-8% [300-500bp equity premium], and in the extreme Buffett case 15-20%.